The Taoiseach's speech on immigration has received global recognition for 'lecturing' US President Trump on immigration. 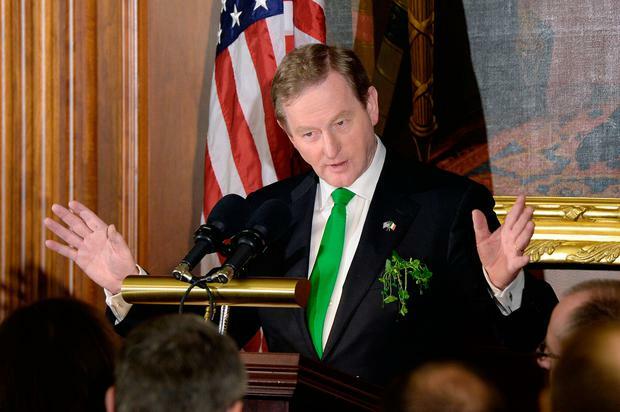 US media in particular were quick to praise the Taoiseach with the The New York Times saying: “Irish Premier uses St Patrick’s Day Ritual to Lecture Trump on Immigration”. The article reads: "Mr. Trump found himself in a roomful of kelly-green-clad lawmakers in the Capitol for the Friends of Ireland luncheon, being lectured by Enda Kenny, the Irish prime minister, or taoiseach (pronounced THEE-shakh), about the virtues of America’s immigrant legacy and the contributions that immigrants had made to the country." Fox News praised the Taoiseach with the headline: "Ireland's leader pushes Trump on illegal Irish immigrants." The article reads: "Irish Prime Minister Enda Kenny is urging President Donald Trump to help Irish people living in the U.S. illegally, saying they just want to "make America great." Fox News also praised the Taoiseach's humour saying: "Speaking after Trump at the luncheon, Kenny showed off his country's famed wit, saying that he "just saw the president of the United States read from his script." Sinn Fein President, Gerry Adams, said Enda Kenny was "on the button" when he appealed to President Donald Trump to support the Irish undocumented. The republican, who was a guest at Speaker Paul Ryan's St Patrick's lunch along with Mr Kenny and Mr Trump, said the challenge was to turn words into action. "The Taoiseach's remarks were on the button," he said. "We now need to build upon that. Businessman and former New York mayor Michael Bloomberg praised Mr Kenny for urging Donald Trump to help the US's undocumented immigrants. "It was great to see him raise the issue of undocumented immigrants when he was at the White House yesterday - thank you for that," he said. "This is a country that has benefited from immigrants. Without immigrants we wouldn't have a country and immigrants from Ireland have played a very important part and a number of different waves of Irish immigrants coming here and really contributing to our society. "They contribute to our cuisine and to our culture, to our economy and to our wellbeing and happiness, and I think it's fair to say without the Irish, New York City would not be anything as great as it is today. "America became a global powerhouse because we welcomed immigrants and to remain a global powerhouse we really do in this country have to continue to welcome immigrants and give them a chance to play their part in our country's future. "And that's really what celebrating St Patrick's Day is all about." Mr Kenny told the event he hoped progress could be made on the issue with the new US administration.